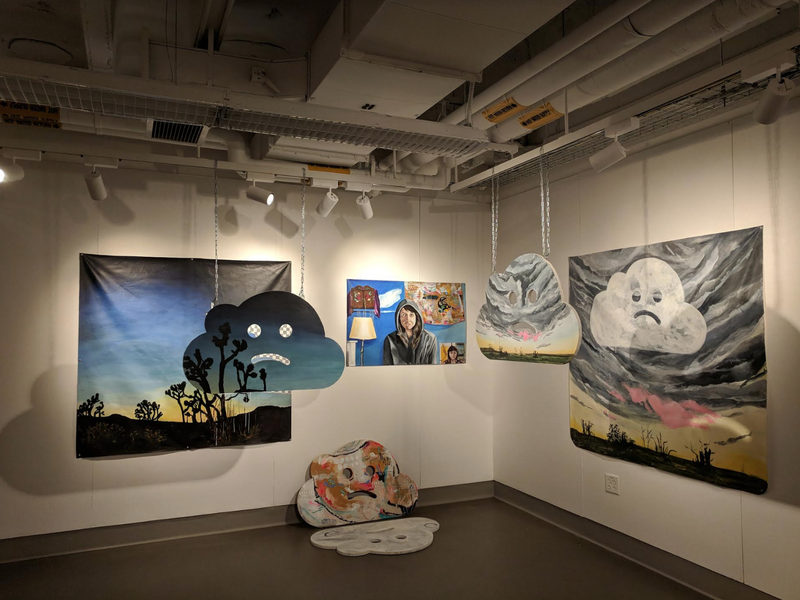 Every summer, MassArt’s Boston Low-Residency MFA program presents an exhibition on the works of its Masters candidates. 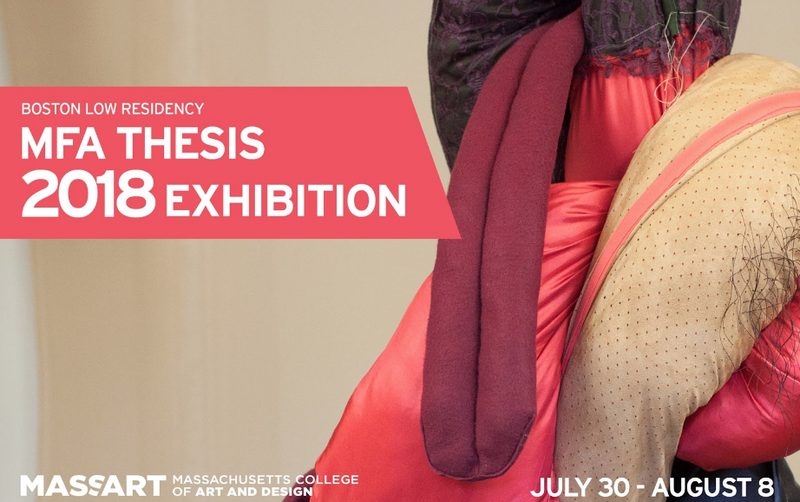 This years presentation, the MFA BLR Thesis Exhibition- open from July 30th thru August 8th- is showcasing the culmination of unique bodies of work from 12 artists in the final year of their Residency. Independently, the artists have each crafted their own style in varying degrees of mediums- sculptural works of fabric and stitched craft hang in some exhibition rooms while hollow metal and wire forms rise from the ground in others; painted wooden clouds float heavy before ethereal landscapes; installations explore the relationship between sound and human while others distort the spaces we call home. Yet, despite the variety of works presented, the paintings, drawings, prints, sculptures, objects and more unique to the 12 individual artists (and vastly different from each other in medium and style) exist harmoniously in the BLR Thesis Exhibition. 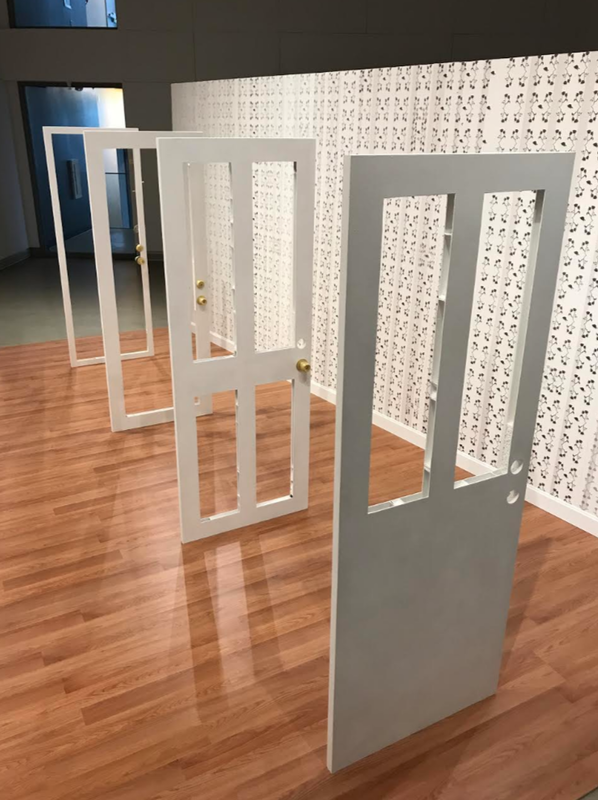 Some are connected by the universality of their themes: exploration of family structures and domestic spaces, the act of storytelling and the malleability of memory. Others are connected in their addressing of contemporary issues related to social injustices, creating space for feminist voices or standing to face oppressors. The creation of space by various artists- be it space for contemplation, space for escape, space for exploration of memory, space for discussion- invites visitors to find their own space in the BLR Thesis Exhibition. 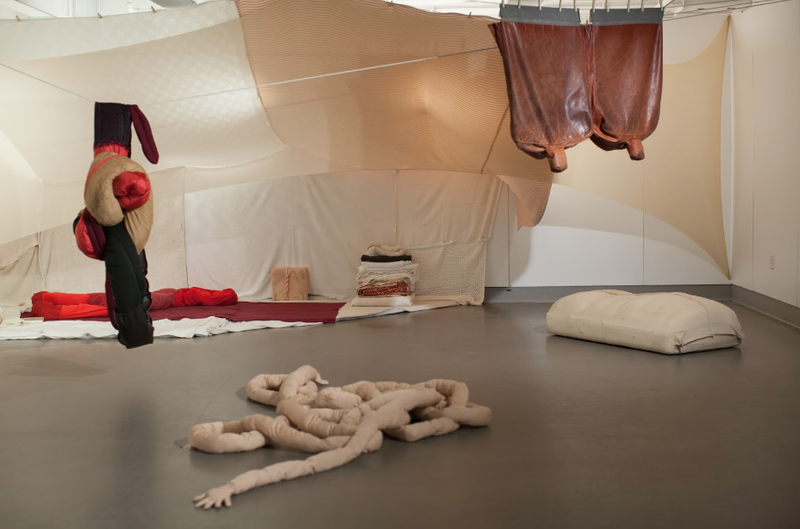 Below are a few of the artists whose bodies of work create and explore space in the show. 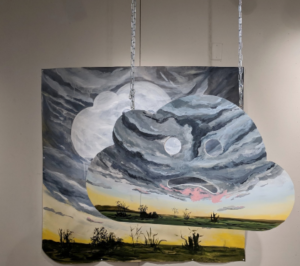 Rachel Rizzo is a New England native who grew up and spent her teenage years feeling most at home with nature or hidden in the realm of drawing and painting. She is currently an artist and organizer in Boston’s DIY art and music community and a full time Visual Art Educator at a Boston Public School. Leslie Fandrich is a Canadian born & raised artist living in Warwick, NY with her husband and two children. 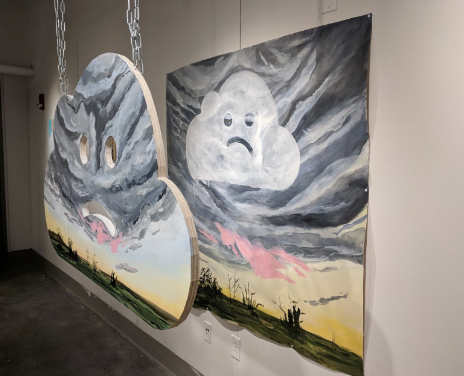 Besides having work exhibited in galleries throughout greater New York and Utah, she is a member of the Orange County Arts Council and regularly participates in the Open Studio Tour and local art events. Taryn Pizza is multimedia artist and arts educator based in New Jersey. She has been an art educator since 2013 and her work has been exhibited around New York, New Jersey, Massachusetts, and Denver. 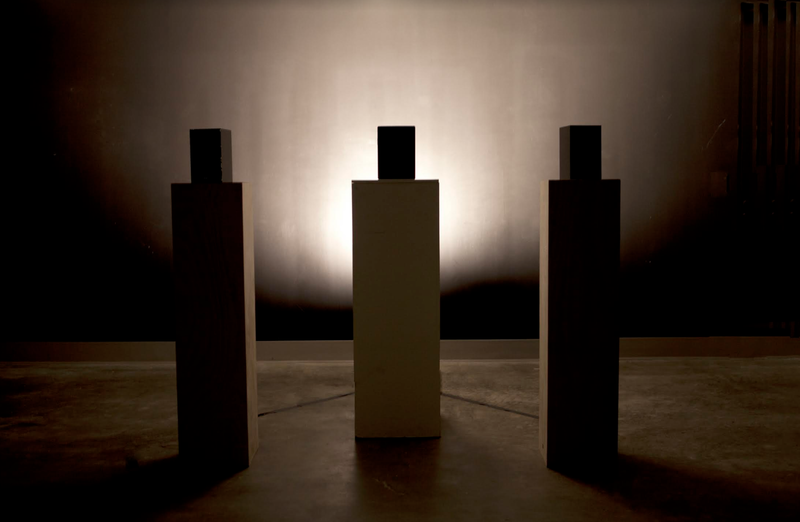 Laura Ganci is a multi-disciplinary artist and musician born in Hartford, Connecticut. Her work has been exhibited around Connecticut and Massachusetts, and she has worked with youth organizations to create large scale murals. She is also a leading member of the Boston-based band American Echoes, which has toured 15 U.S states. 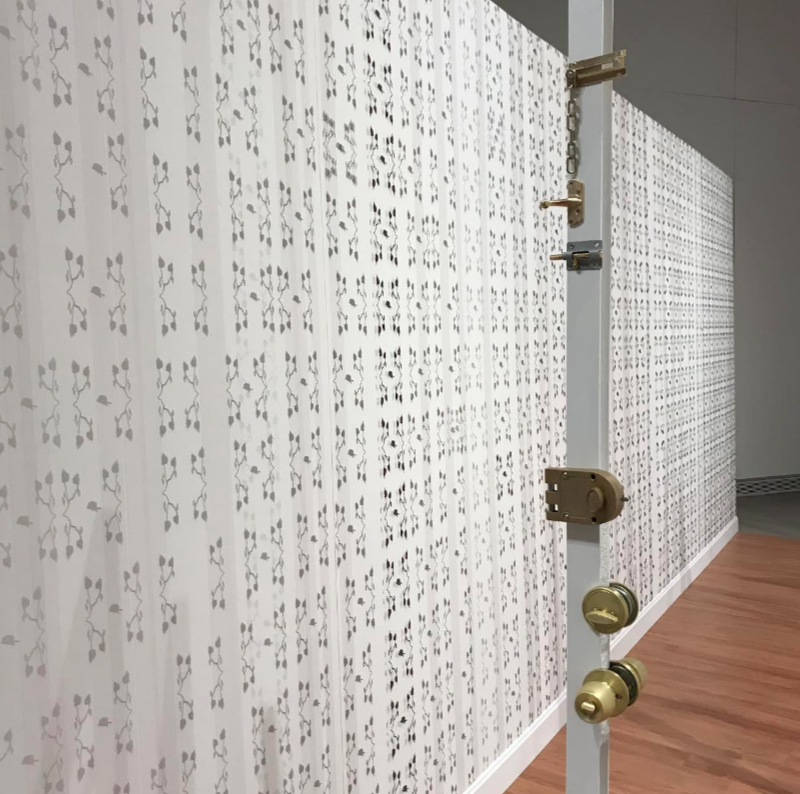 MassArt’s MFA Boston Low Residency Thesis Exhibition will be on view July 30th thru August 8th at the college’s Design and Media Center, located at 621 Huntington Avenue, Boston, MA 02115. The opening reception will be held on Thursday, August 2nd from 6-8 pm.